Fair Trade Friday is a membership club that enables women to empower other women. Artisans are paid directly, and 100% of the proceeds from each box goes toward helping women around the world. 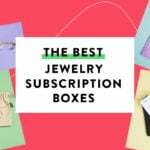 They have three different subscriptions: The Original Box, Bracelet of the Month, and Earrings of the Month. This review is of the Earring of the Month Club. Ships to: US only free. It looks like Fair Trade Friday has upgraded its packaging and printed materials! Nice! This card was included with information about the earrings and the charitable organizations that are included. How funky! These earrings are super cool. They have a really exotic vibe that I love. They were handmade and hand-dyed from woven grasses! The discs measure about 2″ across. Fashion & Compassion is the organization this month, and they provide training and dignified employment for artisans in Rwanda, Uganda, Mexico, Honduras, Ethiopia, and their refugee community in Charlotte, NC. Can you still get this box if you sign up today? No, you will receive the March box. Order by the 15th of each month to get that month’s box. Value breakdown: This box is $12.99 including shipping. This month’s earrings are listed at $18. That’s a discount of 28%. “Fashion & Compassion creates empowerment communities where vulnerable women connect with God, one another and resources as their lives are transformed. I’m all for economic support to those with less, but I am most definitely NOT ok with religious organizations targeting those in poor economic circumstances for proselytizing purposes.